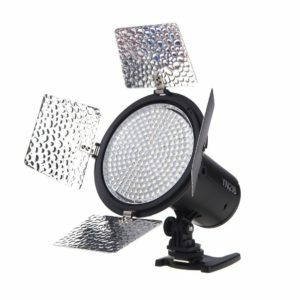 LED lights for filmmaking and video production are now super-affordable and hugely convenient because of their safety, portability and battery power. In this post, we’ll review three of the best lights for under £50. Want some powerful tips on how to make great videos for social media? Click here. They’re cheap. Every one of these lights costs less than £50! They’re safer than traditional hot lights like redheads or blondes as they don’t generate anywhere near as much heat and there are no cables to trip over. They can be powered by batteries, which means that you aren’t tied to plug sockets. Budget models can’t hope to come anywhere close to traditional hot lights for sheer lighting power. If you’re trying to light an expansive location like a church or hall, you’ll need redheads like this great set for less than £100 or blondes or Fresnels. Because they aren’t usually super high-powered, they will need to be placed closer to your subjects. The quality of the Tungsten light colour will vary greatly between models. Some have plastic Tungsten filters that slide in front of the light. Others have dedicated Tungsten temperature LED beads. The latter usually produce better results. 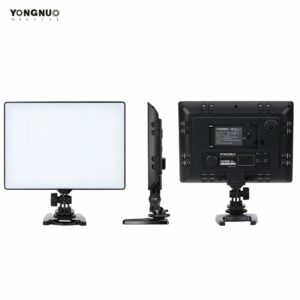 YONGNUO YN-216 is a fantastic little spot light for filmmaking or video production, featuring 216 high-luminance LED beads. It really is super bright. It is compact, sturdy and well-made. It’s the perfect all rounder for video lighting. It features three power supply options: AA batteries, Sony NP-F batteries or a mains power adaptor (not supplied). The light can be installed directly onto a DSLR or camcorder using the supplied hot/cold show mount. It can also be mounted on a standard light stand using the quarter twenty thread. The light comes with four colour temperature filters. Unbeatable value at less than £50. The YN300 Air has a built-in milk defuser that produces soft light with a wide illuminating angle. Featuring variable colour temperature, this great little light produces the best quality light for filmmaking of any of the three units in this post. It makes an excellent fill light when used at a close distance. It features an LED display on the rear and a dial that allows you to dim the light and modulate between daylight, tungsten or a mixture of both. A number of buttons allow you to make other easy adjustments. You can mount the light directly onto the hot shoe of your DSLR or camcorder (not powered) or to any standard light stand, using the supplied mount. It’s super easy to use, is highly adjustable, well-made and durable. If you prefer to use AA batteries, or if you don’t want to invest in a new battery and charge system, we recommend the Neewer® 6pcs AA Battery Replacement Mains Supply NP-F970 NP-F550. This handy little adapter opens up to accept six AA batteries. It then slots into the NP-F socket and works a treat. It works out much cheaper than buying NP-Fs at a bargain price less than £10. The YN300 Air is an unbeatable value at less than £35! Light source: 96LED beads, Colour temperature: 3200K-5500K, Output power: 18W, Lumen: 2000LM, Average service life: 50000H, Luminance angle: 100°, Colour rendering index: greater than to 95, Power supply: 1 NP-F lithium battery or external 8V, 5A DC power (no power source or battery included), Dimensions: Approx. 210x175x62mm, Weight: Approx. 500g. The Neewer CN 160 is a powerful, lightweight and durable little light for filmmaking and it’s a real bargain at less than £30. It’s strong enough to separate your subject from a wall or backdrop. 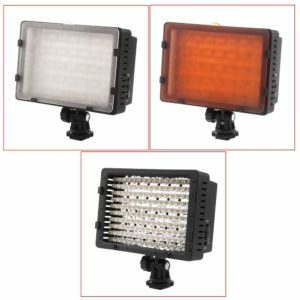 It’s also a very useful general purpose light for use when filming on location after nightfall. It’s also super convenient to power as it accepts 6 AA batteries. It can also run on Sony NP-F batteries and, using a supplied adaptor, several other camera batteries. The light features a rotating dial switch for switching the power on/off and dimming. There is also a battery power indicator. We love this little light and it’s popularity is no surprise given its rock bottom price at less than £30. Audio is just as important as video! It’s very easy to start making your own films now that most smart phones and DSLRs are capable of recording HD or even 4K footage. Beginning filmmakers have a tendency to place all their attention on capturing the best possible image, but they may fail to understand that audio is just as important as the visuals. Many beginning directors will rely solely upon the internal microphone on their phone or camera. In most circumstances, this will not produce acceptable results. It is common to end up with audio that is inaudible, muffled, echoey, dominated by background noise or completely marred by wind noise. In this blog post, we’ll cover the very best low budget sound equipment for filmmaking. Want some power tips for making great videos for social media? Click here. Recording dialogue and other sound on location is challenging and requires careful planning, preparation and the use of specialist sound equipment for filmmaking. Luckily, you don’t need to have a huge budget to capture high quality audio. Everyone knows about the excellent sound equipment for filmmaking made by RØDE, but their products are very expensive for a beginning filmmaker who has to make their budget stretch to cover a camera, lighting and sound equipment. Luckily, there is another company that makes excellent microphones at a much lower price point: BOYA. 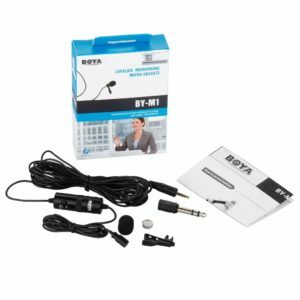 The BOYA BY-M1 3.5 mm Lavalier Microphone for Smartphone and DLSR (with microphone input) is an excellent lapel microphone. It is perfect for YouTubers or if you are recording interviews with only one person. It’s an excellent value at less than £15. The BOYA BY-M1 is an Omni directional lavalier microphone, designed for Smartphones, DSLR, Camcorders, Audio recorders PC etc. It has a stated Omni pickup pattern, for full 360° coverage. Best of all, it has an integrated 6-meter (20″) cable which i much longer than that supplied with the much more expensive RØDE version. You really need this length if you are connecting to your camera or smart phone. It connects with a 3.5mm plug to the headphone socket on your smartphone. For DSLR users, this microphone includes battery power so that it will work with cameras that are not capable of supplying ‘phantom power’. The mic comes with a lapel clip, a foam windscreen, a 1/4″ adapter, and an LR44 battery. Sometimes, you’ll even find free carry pouch in the box. It’s probably best to contact the seller to check if a pouch is included before buying. If you’re going to be shooting outdoors, we recommend that you buy a ‘dead cat’ or ‘furry’ wind shield for your lavalier microphone. This great option costs less than £10. Click here for a great video showing you how to mount a lav mic. A boom mic is a directional microphone mounted on a pole and held just out of the camera frame, usually above the heads of the subjects. Boom mics are probably the most used sound equipment for filmmaking or TV. The BOYA BY-PVM1000 XLR Condenser Microphone is an excellent broadcast quality shotgun mic. 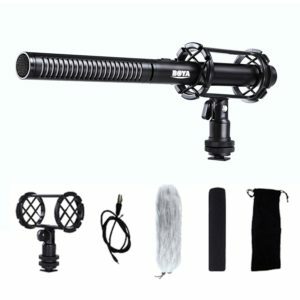 It’s perfect for use as a boom mic or for mounting on your camera. It’s an incredible value at less than £50. It comes supplied with a mount to attach it to a boom pole or mic stand and a ‘dead cat’ windshield that will minimise wind noise when shooting outdoors. It also includes a 1.5 M Cable, a sponge wind cover, jack adaptor, a shock Mount, four replacment rubber rings for the shock mount and a carry punch. Looking for a boom pole? Many people will simply make their own, but this excellent option costs less than £30. The great news for budget-strapped filmmakers is that you can use most smart phones to record sound directly from either of the BOYA microphones outlined above by using the iOS ‘Voice Memos’ app or, for more control over settings, using the Voice Record Pro app. Similar apps are available for Android. If you want to take your sound to the next level, you will want to invest in a digital audio recorder. Many filmmakers will use a camera-mounted mic and a separate digital audio recorder connected to an external microphone. These professional audio recorders afford maximum control over audio, allow the microphone operator to get the mic closer to the subjects and provide a useful backup copy. 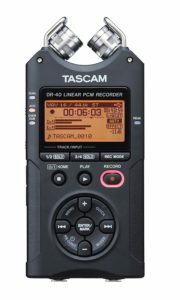 We recommend the hugely popular Tascam Dr-40 4-Track Portable Digital Recorder. It’s no small-change purchase at just under £160, but it’s money well spent as this recorder will be able to cope with your equipment upgrades as your filming career progresses. It is a handheld 4-track recorder with two adjustable condenser microphones and XLR / 1/4″ mic/line inputs with phantom power. The dual recording mode captures a safety track at a lower level to avoid distortion. The recorder boasts a stated 15-hour battery life from three AA batteries. It uses SD/SDHC cards, supporting cards up to 32GB. You can easily connect your Boom Microphone or Lav Microphone or other sound equipment for filmmaking to this device. This Tascam recorder is an investment that you won’t regret making. Your first priority when making social media videos must always be the safety of everyone involved in your shoot. Never try to shoot stunts or dangerous practical effects. Leave that to the experts! Don’t climb ladders, ascend to dangerous heights or stand in the road to get a certain shot. Don’t leave your equipment or cases lying around where people could trip or slip. Restrict public access to locations where there may be tripping hazards such as cables. Be careful with tripods, they can be hazardous. Be aware of your surroundings. Are there dangers such as passing traffic? Make sure that you have adequate Public Liability Insurance. Develop a storyboard or a list of shots, so that you know what you need to shoot. Prepare a script (however short) and share it with anyone who will appear in your video. Give them time to learn the lines well before the shoot. If the people appearing your video are not actors, negotiate the script with them. Allow them to make suggestions for improvement. Secure permission for use of your location. Make sure everyone who needs to be there knows the date and time and that they get a reminder closer to the day. Pack your equipment and make sure you have fully charged batteries for all equipment and any necessary extension leads etc. Get permission from the person or organisation responsible for any building or location that you plan to shoot in. Get permission from anyone who will feature prominently in your video. E.g. Anyone in close-up or in the main action. Have signs on location clearly stating that filming is in progress. You can find free release form templates online. You want to avoid making social media videos with muffled sound, inaudible voices, overpowering music or distracting background noises. We recommend using an external microphone like the RØDE VideoMic GO On Camera Microphone. If you can’t use an external microphone, make sure that your subject is close enough to the camera for the sound to be picked up. Check out our article on great low budget audio equipment. Lighting is just as important for social media videos as sound. We recommend this Red Head Dimmable Lighting Kit as a great, versatile and value-for-money lighting solution for pretty much any video project. Avoid placing your subject in a sunbeam, against a window during the middle of the day or in very bright light as this will lead to overexposure, where the person’s face will be whited-out and featureless. Conversely, be careful not to shoot in dim light as the lack of light will be amplified in your final video. People will quickly hit the ‘stop’ button if they have difficulty seeing the content. Try to find a background for your video that provides some added visual interest. Nobody wants to see a video of someone standing in front of a magnolia wall. People with a little bit of technical know-how may want to digitally add a background using Chroma Key technology. This great value Green Screen Background Backdrop should fit the bill. Ideally, social media videos should not last longer than ninety seconds. That may sound very short, but it allows plenty of time to get any message across. You can always provide a link for people to access further information online. The research shows time and time again that people will not engage with lengthy social media videos and the number of views will drop off sharply for every minute you go over the 90 seconds. Remember that the duration of your video will appear in the link and people will consider this when deciding if they’ll watch it. Use persuasive text to entice the viewer to click ‘play’. It’s also important to use tags and categories as these help search engines to sort and serve your material to others. A thumbnail is the screenshot form the video that visitors will see before they click play. A title slide is unlikely to attract much attention. Choose some sort of action scene from your video. First impressions count! It makes sense to upload your videos to one online service such as YouTube or Vimeo. Both services allow you to create your own ‘channel’. You can direct visitors to this channel, where they can view all your previous videos. Don’t make the mistake of using a song from your favourite band or from the soundtrack of your favourite movie or TV show. You could find yourself facing a substantial fine. Youtube or Vimeo are both likely to flag the copyright violation automatically with the rights holder. You can find royalty-free soundtrack music here, which you can use free of charge as long as you credit the composer. Consider including your logo in your video. This could be easily done by having a pop-up banner in the background. Provide a link to your website in the description. Disagreeable music may result in an early stop. Don’t go crazy with transitions! Star wipes and fades between shots are fun, but they look really amateur and can quickly become a distraction for the viewer. Pick one simple dissolve or fade and stick with it. Your video doesn’t need to be high definition, but it shouldn’t be blurry or fuzzy or dimly lit. We can provide practical training for video production. We also have all the expertise and equipment to produce great quality videos for you. (We recently worked on Game of Thrones Season 7.) Fill in the contact form below to find out how we can help you.